School craft projects that use hand prints and thumbprints are always my favorite. It is such a great keepsake and they are usually beyond cute. 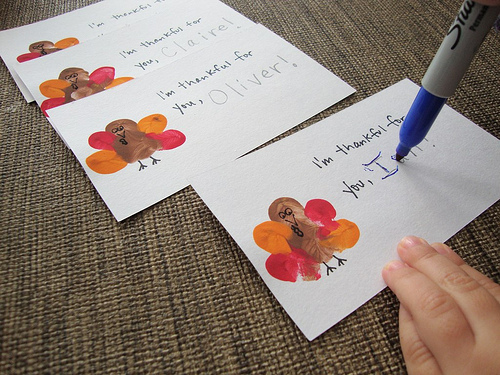 For Thanksgiving, let the kids help make the place cards by decorating plain place cards with these cute thumbprint turkeys. They would also make cute invitations, Thanksgiving greeting cards, or just fun cards to write down what you are Thankful for this time of year. You can check out these cute thumbprint turkey cards over at Silly Eagle Crafts. Love these!!! We're doing a Turkey project tonight, i think we'll write what we are thankful for on them. :D Thanks so much for sharing! I love all your Blogs!